Group Tickets: For groups of ten or more, a discount is available. Please email info@thegenealogyshow.uk for further details. Carer tickets: For visitors with a full-time carer, an application for one free admission ticket can be submitted. This concession is only available in advance. Please email: info@thegenealogyshow.uk with a copy of your supporting documentation. All applications must be received no less than seven days prior to THE Genealogy Show. Catering: All catering is provided by the venue. Whether you are looking for breakfast, lunch, dinner or snacks there is plenty of choice. For further details click here. Free shuttle buses run continuously around the NEC site and car parks during exhibitions, usually starting one hour before and finishing one hour after the exhibition. You’ll find operating times listed on all the bus stops. If you’d rather walk from the car park, simply follow the finger post signage. NEC Facilities: You’ll find portable cash dispensers (withdrawal fees apply) around the venue. (Free NatWest and HSBC ATMs can be found at the train station). The NEC has plenty of toilets. You can also access cloakrooms, phone charging points, pay phones (charges may apply for these facilities) and post boxes. Wifi: The NEC offers free wifi to visitors. Mobility: Wheelchairs – available free of charge for blue badge holders and £5 for all other visitors. The number of wheelchairs available is limited, so if you’ve got your own, please bring it with you. Scooters – £15 per hire for all visitors. All pre-bookings will be held until 11:00 on the day booked for, unless otherwise advised. 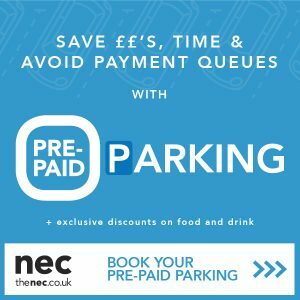 Please note: Mobility equipment hire is only available during show opening times and the NEC only accepts payment by card for any equipment hired. Dogs: No entry permitted to dogs. However, Guide dogs/Assistance dogs are welcome at the NEC. 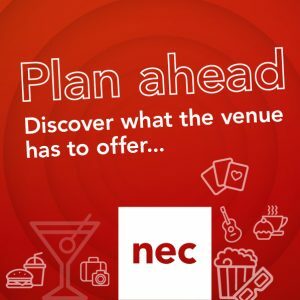 You can also visit the NEC’s FAQ’s page for further information by clicking here.